Please note that this post is a sponsored post. I was compensated for this post. This post contains affiliate links. That means I may be compensated (at no additional cost to you) if you click a link and make a purchase. Please see my full disclosure policy. Every Christmas I’m always trying to find new creative ways to stretch my dollar. I’m a frugal girl, I hate spending money, if I don’t have to. I use Dollar Tree for many of Holiday items. I like to decorate my home for Christmas and I’m always on the lookout for inexpensive, fun ways to make new crafts. Dollar Tree helps me stay on budget. As I was wonder Dollar Tree today looking for a new craft to make for Christmas, I found the metal wreath ring and Santa Hat. I looked for some white colored decorative mesh, but my store didn’t have any. I searched the store for something I could use and came up with an alternate solution, the scrub buddies static duster. There were two duster pads in the box and that was not enough for the entire metal wreath and my store only had the one box left. Luckily, I was able to cut them in half and use both sides. I used white duct tape to tape the pads down to the metal wreath. I had the duct tape on hand, but you can pick some up at Dollar Tree as well. I also used the duct tape to secure the Santa Hat. The final product was extremely cute, in my opinion! It is simple and fun! Best of all, very inexpensive so that leaves room in the budget for other fun craft ideas! There are so many fun things at Dollar Tree for the Holidays! I can’t wait until I can put this up with the rest of my Holiday Decor! I love quick and easy crafts like this, especially when they’re cheap! What a great idea! My nephew would really love it, and it looks so nice! Just what I need! I don’t think DIY crafts, especially for the holidays, should be difficult or break the bank. Thank you for posting this fun and inexpensive craft! No gift is cheap when it is given from heart. I feel it is lovely. And seriously I love this sort of crafts. 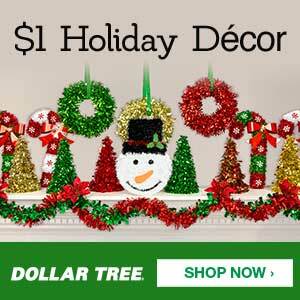 I am a huge fan of Dollar Tree decorating and this is an awesome idea. I love it! I may just even make one for my front door! I am a fan of easy diy crafts. And I like your idea. It’s not only easy to make but cheap too. That is such a good idea! I love decorating on a budget too! The Dollar Tree is the best place to find DIY items. This would be a fun activity to do with the kids or even at a school. What a great idea! I love this, we have the equalivalent here in pound shops and you can get some fab things for crafts! Spending only $3 on a Christmas wreath is a bargain. I wish I could do that this Christmas. I like this DIY Santa Wreath, it is so beautiful, it so easy and it will not cost you a lot in making this. This is very affordable and creative! Thanks for the idea. We haven’t started decorating for Christmas yet. I’ll check out Dollar Tree! Great item from Christmas decoration under budget. Sweet. Oh my goodness that is absolutely adorable! I think I will make our house one of these as well, easy for the kiddos to do. This is brilliant! I love homeware and DIY projects are a great way of cutting costs that can add up! Your wreath looks fab! This is so genius! I’m going to make these for our friends and family. This is such an awesome diy project! Not only is it super easy and cheap, but it’s cute! This looks super easy and cheap. Perfect to create with my little girl. I am so ready for the holidays this year! After a tragedy in my family, we sometimes have a hard time celebrating the holidays. Little by little, I am working on bringing in holiday cheer into our house but it isn’t always easy. This is such a cute and simple way to do that. What a cool and affordable diy idea! I need to start collecting these ideas for the upcoming yuletide season.